+ The HP Pavilion dv2800t Artist Edition series notebook is a Notebook PC designed for the Digital artists and people who wants to stand out among the crowd. HP wrap around awe aspiring digital art, which is winning design of HP’s Action/Make Art contest. So if you are looking for inspiration, you don’t have to look any further than your own sweet notebook. The custom graphics embedded into the imprint finish on top and wrap around on inner side and even goes as far as a custom painted keyboard and touchpad that blend well in the design. The custom paint job is also made very durable for daily usage. Beside all the Bling-Factor the HP Pavilion dv2800t Artist Edition Notebook PC is reasonably armed to the teeth featuring; Intel Core 2 Duo Processor T7500 (2.2GHz, 4MB L2 Cache, 667MHz FSB), 2GB DDR2 RAM, NVIDIA 128MB 8400M GS Video Card and 250GB 5400RPM SATA Hard Drive. Build quality is excellent with a design that captures your high-tech lifestyle. This HP series comes with genuine Windows Vista Home Premium, which includes Windows Aero, Windows Media Center, and instant search functionality. 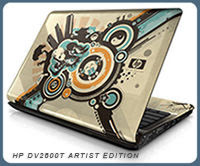 HP dv2800t Artist Edition Notebook PC come with Bluetooth, webcam and all the nick-neck you need for high-tech lifestyle. And off course its reasonably priced, as well!